XP Defender 2013 is a fake security program that pretends to be an antivirus tool. The program looks like a normal antivirus but, in reality, it can not remove viruses, trojans, etc., nor will be protect your computer from legitimate future infections. It is created with one purpose to trick you into purchasing the full version of the software. Thus, never trust anything relate to XP Defender 2013 and uninstall it as soon as possible. 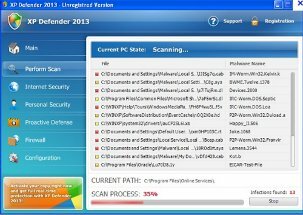 XP Defender 2013 is promoted and distributed with the help of trojans that come from fake online scanners or other misleading websites. When the rogue is installed, it will register itself in the Windows registry to run automatically. The program will perform a system scan and list a lot of trojans, viruses and other malicious programs. Of course, the scan and its results are a fake. The rogue uses the false scan results as method to trick you into purchase the full version of the software. Ignore all that Windows Security Renewal will show you and remove it as soon as possible. While XP Defender 2013 is running, it will display various misleading notifications and fake security alerts from Windows taskbar. However, all the alerts are totally fabricated and must by no means be trusted. The rogue generates these messages only to scare you into paying for this scam software. Thus, like false scan result, you should ignore all of them. As you can see, XP Defender 2013 pretends to be a legitimate antivirus software but, in reality, it is a scam. You should remove this malware as soon as you notice it installed on the system. Please use the XP Defender 2013 removal steps to uninstall this malware from your computer for free.